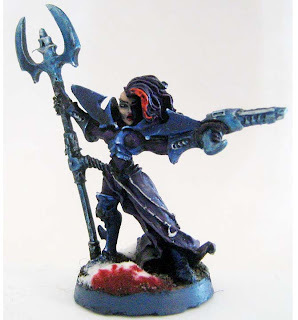 Today, an addition to the Dark Eldar army in the form of an Archite and a completed Wych unit for the Wych Cult. Ideally the Archite is painted in a scheme that highlights both elements of the Wych units with their predominantly purple armour and the warrior units with the predominantly blue armour. 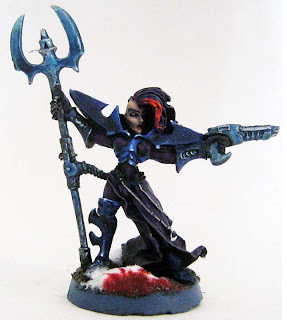 Both the wyches and the warriors use the metallic blue weaponry as shown and has become something of a central theme to the army. The Vehicles in the army use a similar paint scheme, but i will show more of those as i complete them down the road. The first view as shown above, is of the Archite from a side perspective, showcasing the facial features and metallic flesh snares on the flowing gown. I wasn't a huge fan of how off balance the gown was on this model, all in all it seems rather poorly sculpted and did leave some casting issues as far as the wires holding the hooks on her side. It seems there were some air bubbles that made this line rather disjointed. it also hides a lot of the great details in the dark eldar armour. As seen from the front angle the Archite has a rather wind swept motif going on with her hair and gown flowing to the right of the image. I think it's a little quirky, the mohawk is neat, and the bare scalp could leave some room for some freehand tattoo work, however i didn't paint any this time through as i though it would make the model feel somewhat crowded on the gaming table. Little details look great on showcase minis, but when it comes to gaming pieces its a shame to have the model fall over and get scratched or all the little intricate details you spent so much time on just look like visual clutter on the battle field. Here is the Completed unit of Dark Eldar Wyches, the one to the right back was the first painted of its kind, painted in the summer of 2009 with the initial purchase of the models, note that its weapons are not painted with the trademark metallic blue weaponry, this was developed at a later date in the fall of 2009. There are currently seven more models like these in intermediate stages of being painted on my painting desk, I'll take another group shot once the army gets up in a few more numbers.